Independently wealthy thanks to his family's wine business, Max (Michel Piccoli) has relinquished his position as a judge in favor of working as a police detective. Frustrated when the bank robbers he had been running a sting operation on manage to get away, Max is determined to make a major bust no matter what. When he bumps into old army buddy Abel (Bernard Fresson), who is making a living as a small time criminal stealing and selling scrap, Max gets the idea to manipulate Abel and his gang into becoming bank robbers. To this end, he casually suggests that rather than continue with his small-time crimes, Abel ought to consider making one big score. Max then creates a false identity for himself as a banker and begins seeing Lily (Romy Schneider), a prostitute who also happens to be Abel's girlfriend. Max pays Lily quite well merely to spend time with him, dropping casual pieces of information about a nearby bank into their conversations in hopes that it will get back to Abel. Abel takes the bait and sets about planning his heist, but at the same time things get complicated for Max as he begins to have feelings for Lily. The chances of this ending well for any of the characters looks slim. MAX AND THE JUNKMEN gives us a different kind of police corruption than we're used to seeing in the movies. Max isn't interested in money or status; he has the money, and he's already given up status in favor of a job where he can pursue his own ideals of justice. Instead, it is those very ideals that lead Max to his downfall as inflexible standards and a black and white view of the world lead him to instigate a crime just so he can stop it, all without any thought to the possible collateral damage until it's too late. 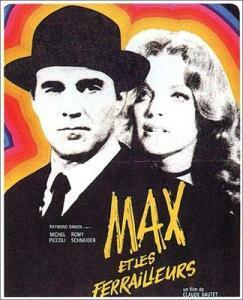 There is undoubtedly a streak of leftist political and socio-economic commentary running through MAX AND THE JUNKMEN – it's a French film made in 1971, what do you expect? At the same time, however, writer/director Claude Sautet makes sure that the subtext doesn't get in the way of his film's entertainment value. You can certainly take some kind of message away from the film, but first and foremost it's a fun and clever caper flick with a great cast. 3 1/2 out of 4 stars.